READ the St.Paul Pioneer Press article Leaving legend: Retiring Mounds View coach Zig Kauls has had an unforgettable ride. WATCH the ABC Channel 5 video by Joe Schmit. 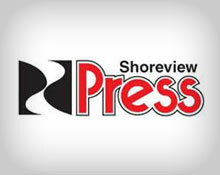 Indeed, the saying is true, They can take the man out of Mounds View but they can’t take Mounds View out of the man. Although it’s been over two decades since my high school days in Arden Hills, MN, I still keep an eye on Mounds View Mustang news from afar. And I still create the perennial design for various MV sports teams and club associations. Call it Mustang Pride or just unabashed nostalgic notions, I’ll always be a faithful Mustang. Recently, I had the honor of creating a design to commemorate an historic event for the MV Mustang community. 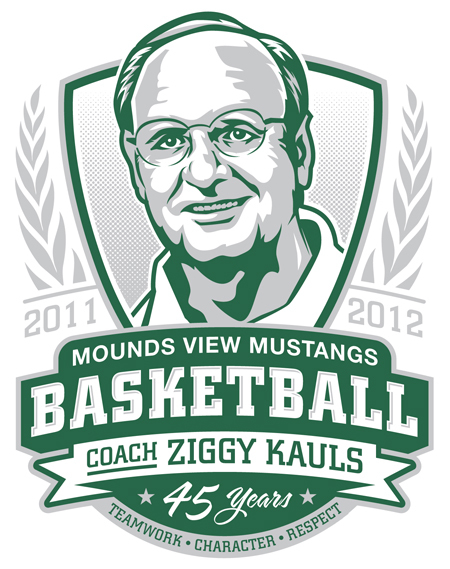 This Friday, Ziggy Kauls, Mounds View High School’s long-time varsity basketball coach, embarks on his 45th and final season leading the Mustangs. Although I did not play basketball in high school, I recall seeing Ziggy’s court-side passion and enthusiasm as I cheered alongside fellow Mustangs in the Senior Stable stands years ago. What I remember about coach Kauls is that he taught more than the game of basketball, Ziggy taught young men lessons in life. Although his records and accomplishments are among the best, his true gift is instilling qualities like teamwork, character, and respect. During his 45 years as coach, Ziggy has made a significant contribution to the community and forged a tradition of basketball excellence at Mounds View H.S. Friday, January 13, 2012 the festivities begin! At 7pm, immediately before the 7:15 game, a dedication ceremony to rename the basketball court Kauls Court will take place at Mounds View H.S. Good luck this season fellow Mustangs. Congratulations, coach, may you enjoy continued success this season and beyond.